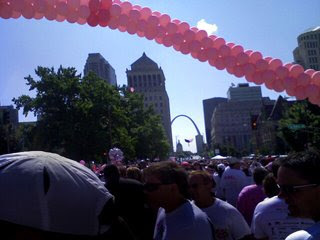 This morning I hit the road with some friends of mine in the Susan G. Komen Race for the Cure in Downtown St. Louis. 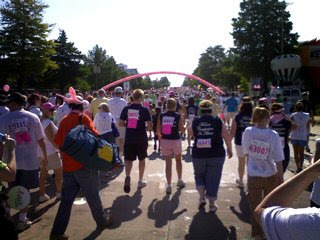 Last year, the STL became the largest RftC in the country, and we were all hoping that the weather, flooding, and high gas prices didn't deter even more participants from joining in. 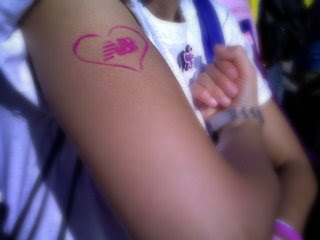 I was part of Kali's Big Dog Crew, a team formed by a friend, co-worker and breast-cancer survivor of nine years. 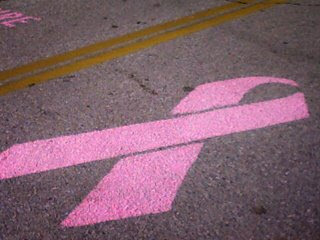 I also raced in honor of my Aunt Kris, who underwent a bout with breast cancer last year. They're still tallying the numbers, but it looks to be another record-breaking year.